Tucked away between the majestic mountains of Lee County, Virginia is a quaint little town called Pennington Gap. What began with the tobacco and coal mining industries, today it seems a place where time has stood still or at least slowed down a bit and that’s not necessarily a bad thing. Along Main Street is an assortment of privately owned shops and small businesses, a cozy restaurant called the Country Boy Café, and an old-fashioned, fully restored movie theatre called ‘The Lee” that serves as an entertainment hub for the town. 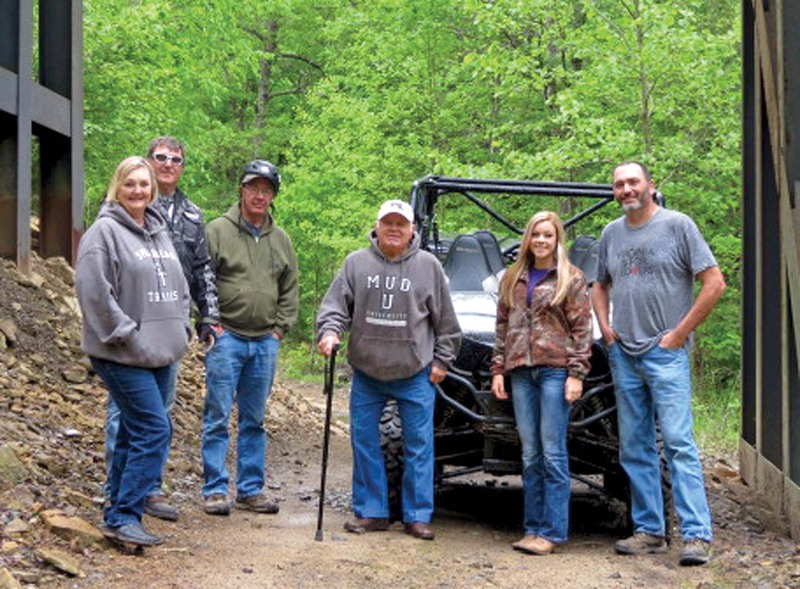 What brought us to town was a new ATV trail. We like to experience not only the trails of any riding area, but also the local community, and we’d been invited to an informal dinner at the Country Boy Cafe, right on the main stretch of Pennington Gap. The Café is every bit as familiar as it sounds, and the scent of delicious, homemade food that always tastes best in this type of café and in this part of the country greeted us as we opened the front door. It’s like walking into grandmother’s kitchen with the same type of fare: hearty dinners, delicious burgers, and a breakfast that will get you through the day. Joining us were Mayor Larry Holbrook, Andrea Hicks from Spearhead Trails, Town Manager Keith Harless, and our soon to be trail guide, Joe Reasor. The welcome mat had been rolled out long before we entered the state however. Driving into Pennington Gap one couldn’t help but notice it’s an ATV friendly town. 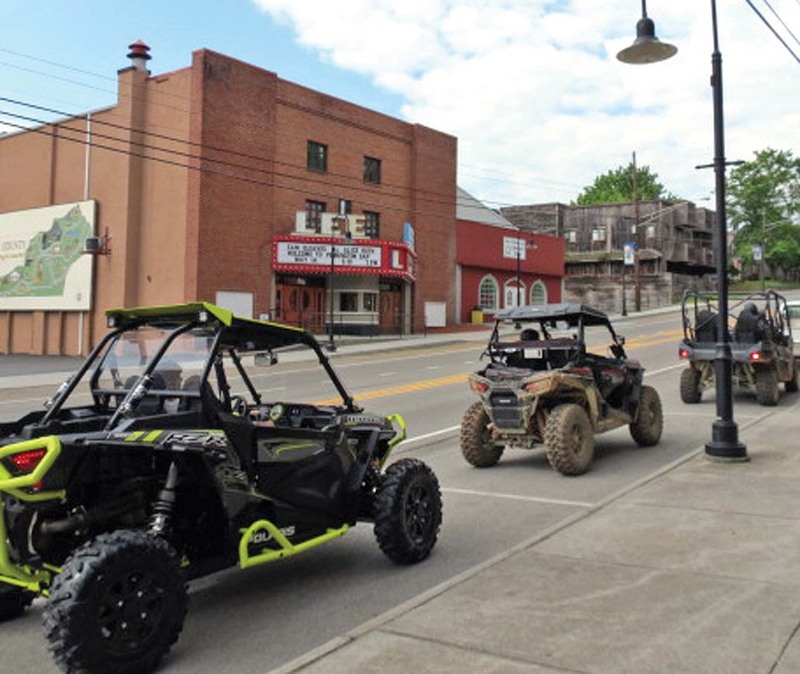 There are signs along main street clearly pointing the way towards the trails via designated ATV routes through town. Our dinner hosts told us this was all part of the plan to not only offer excellent trails outside of town, but to make the amenities in town accessible as well. After all, riders needed a route to the gas stops, food, and lodging in town and a safe access route makes that possible. The route through town begins by crossing the bridge from the ride park entrance and continues on to places like the Lee Theatre, service stations, and to restaurants. 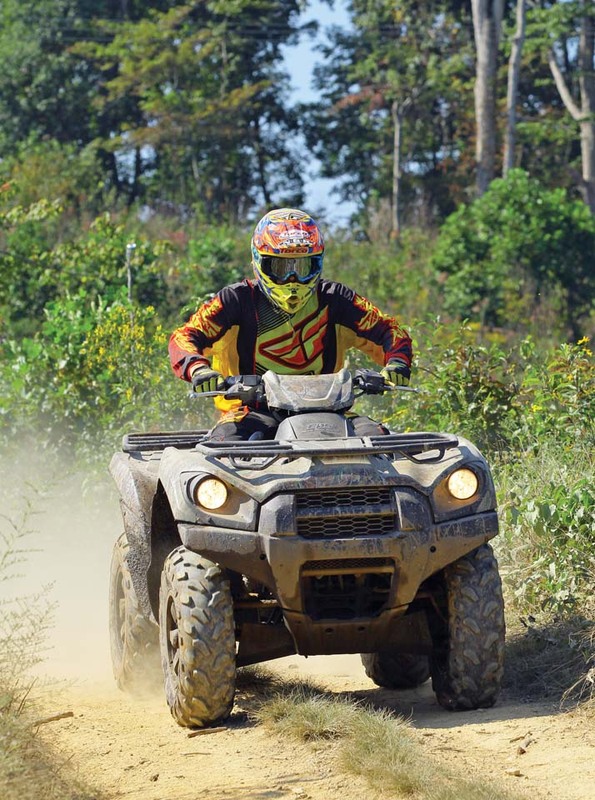 The only restriction is on weekends where the ATV route closes at sundown for safety. ATVs and Side x Sides don’t have the side or tail lamps street vehicles come with, making them harder for motorists to spot after dark. 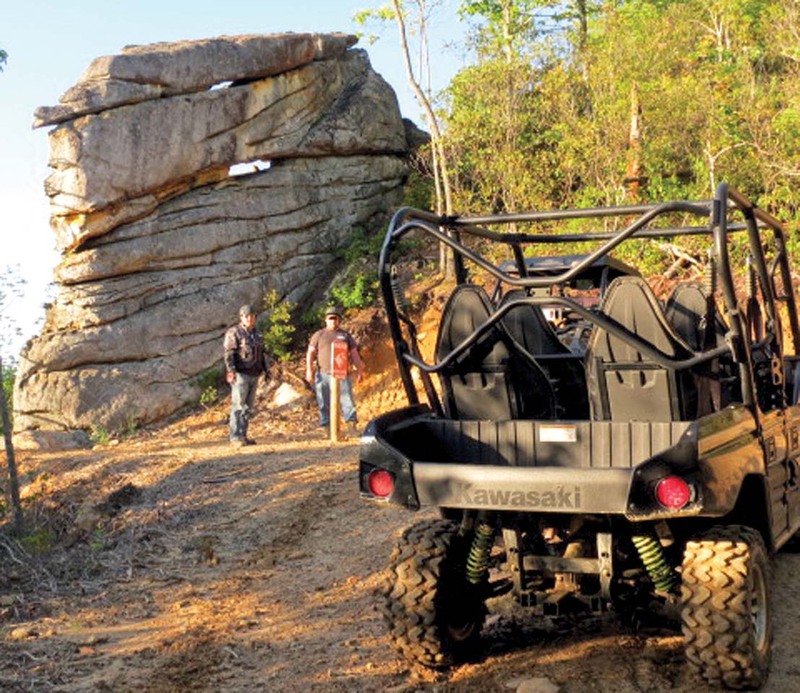 The Spearhead Trail System consists of four distinct trail destinations for off-road recreation; Coal Canyon, Pocahontas, Mountain View, and now Stone Mountain. 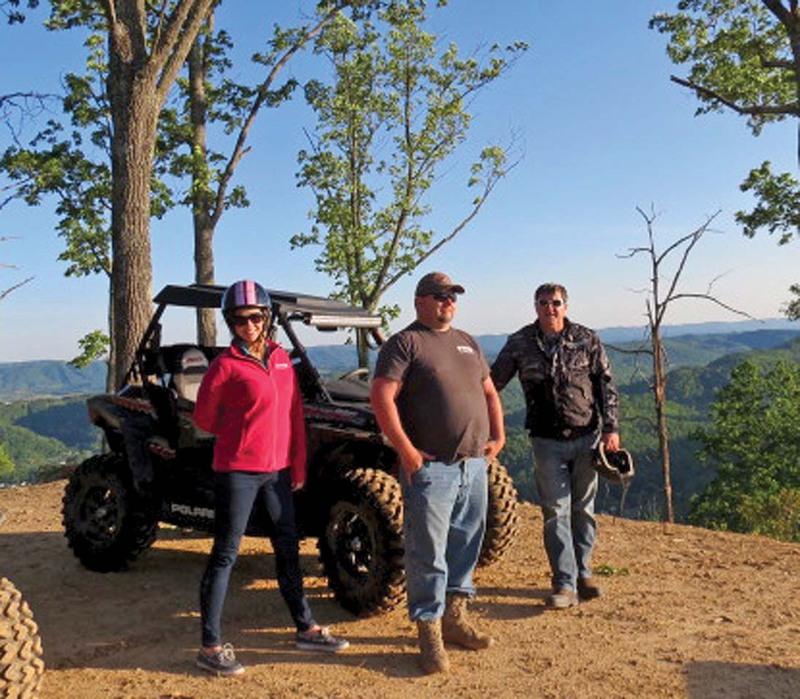 Together they offer more than 350 miles of riding through the heartland of a region rich in heritage, natural beauty, and limitless recreation. The system is actually the result of a state and local initiative to expand on the regions natural beauty and recreational opportunities, and they’re off to an excellent start. 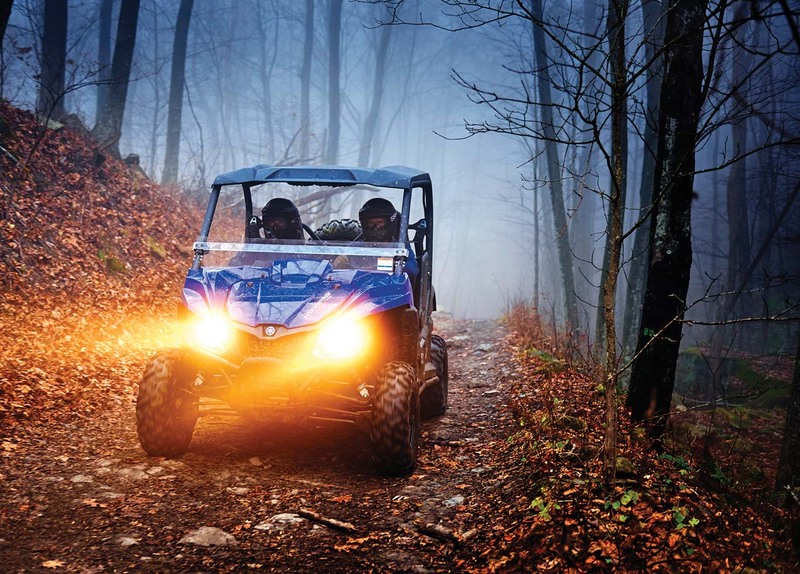 Come for the trails with the whole family, but be prepared for much more. The Stone Mountain trail fits in perfectly with Spearhead trail system and offers over 30 miles of trails. 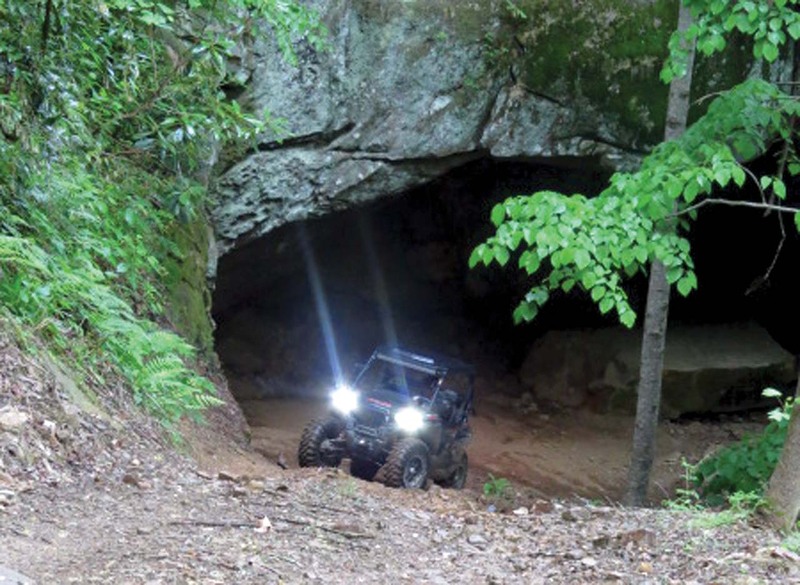 While many trails in the region make use of former mining roads and reclaimed mine sites, Stone Mountain goes far beyond that and most of their trails were built specifically for off-road recreational riding. We love the challenge of the Stone Mountain trails, but it’s only half the story. 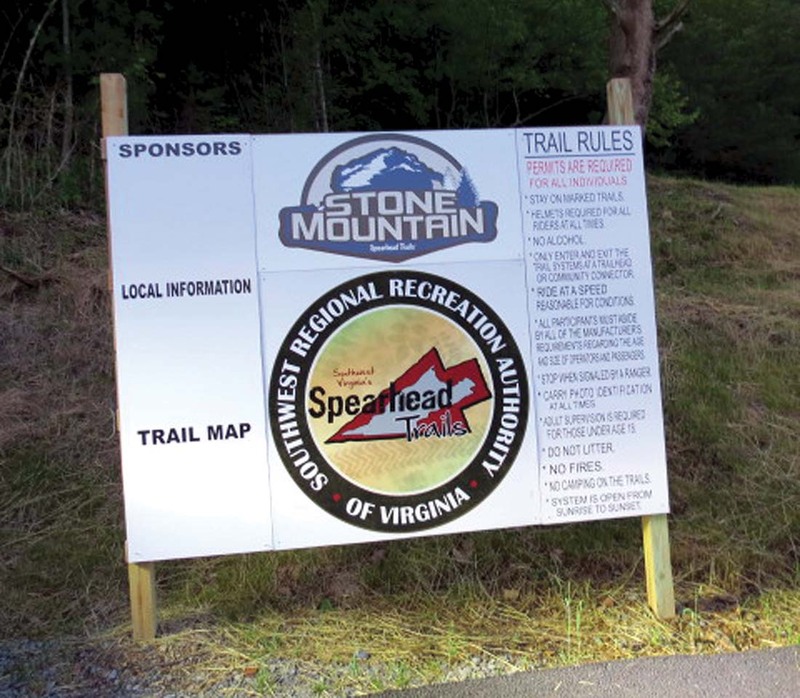 The trailhead is located in Pennington Gap, Virginia, with the trail system primarily built on Cumberland Mountain. That’s the same Cumberland Mountain where early settlers eventually found a route called Cumberland Gap, and while it was an incredibly difficult crossing then, any backcountry crossing today isn’t necessarily a whole lot easier. There are challenges aplenty! Beginning shortly after you pass the new welcome center at the Leeman Field trailhead the trail begins a climb skyward. 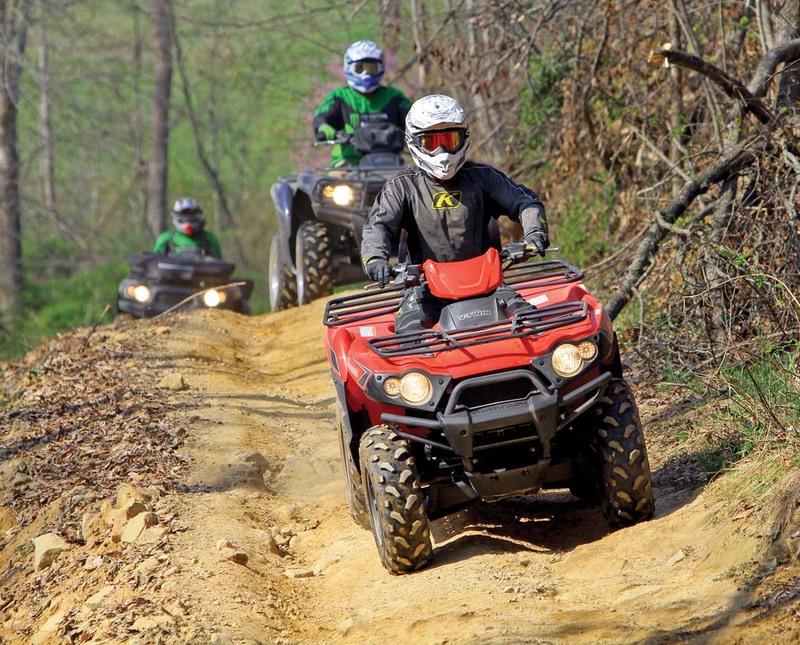 It’s typical mountain riding with rocks, occasional mud or running water across the trail, steep ledges to one side, and a steep drop-off into the trees on the other. Just the way we like it! Considered to be a technical trail, Stone Mountain is a “Blue and Black” rated system that will appeal to intermediate riders but those with families or less experienced riders will not be left behind. For the really adventurous or expert level rider there is plenty of rock crawling and technical challenges of the sort that would worry ones mother, with steep, technical climbs. Along the way you’ll see interesting rock formations typical of the Appalachian Mountains with cliffs and rocky outcrops. Nature lovers will appreciate the hardwood and pine forests, rhododendron thickets, and wildlife. 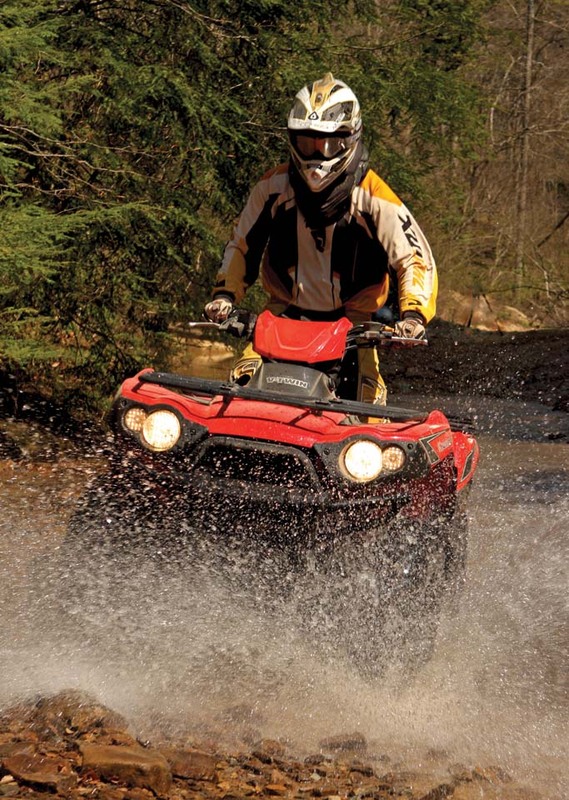 As with any mountain riding, be aware that trail conditions can chance very quickly! A little rain higher up can turn into a raging torrent below. Besides the rewarding challenges along the trail there are other rewards as well. The views are SPECTACULAR! Riding the ridge line is a little like being able to steer the roller coaster. The trail swooped in and out of the trees, and in many place as it crested the top there were picnic tables where you could sit and drink in the unmatched scenery and views that soared to the horizon. With a million hardwood trees below the fall colors can’t help but be incredible. A few areas along the way you will not want to miss are Horseshoe Cave, Bridge, Tunnel Overlook and Trail 99. It’s a ride we didn’t want to end. After a long day on the trail we were ready for a quick shower, some hot food, and a comfy place to crash. MOTHERS PLACE cottage would be our home for the night and it is as comfy as, well, moms place. Homey and welcoming, we were greeted by fresh fruit, coffee and teas, and bottled water. An indoor fireplace makes a great place to sit and relax but if you’re up some great grilling they’ve got a second floor porch and gas grill for outdoor cooking. It feels like home away from home just like the name implies! Since camping goes hand-in-hand with trail riding the trailhead at Leeman Field RV Park has 21 full service spaces. These lots are conveniently located close to the trailhead, and additional spaces are available without electricity. For a more rustic experience you can pitch you tent along the river. Whether you choose a local place to stay, an RV, or go full nature with your tent you’ll find everything you need, and the stuff you forgot at home is available in town. It’s always great to try a new trail but the Spearhead Trails Stone Mountain system in really something special. The town of Pennington Gap and the entire region are very welcoming and it’s really a great, family oriented destination. 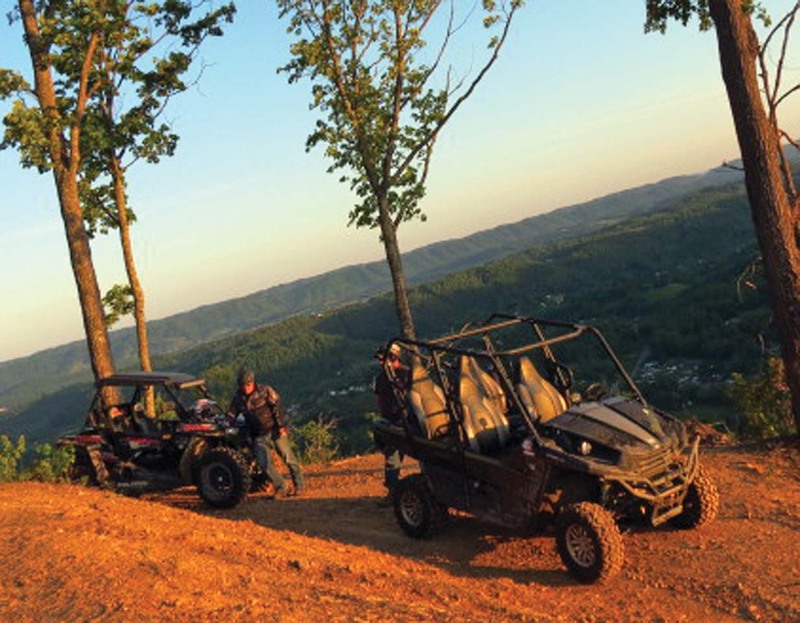 Whether you enjoy trail riding, mountain biking, hiking, camping, or just relaxing in nature there is much for you to explore in this region. The main trail system may be called Stone Mountain but it’s a diamond already. Special thanks to our guide Andrea Hicks and Joe Reasor, and Charlotte Mullins & Chris Sturgill from Southwest Regional Recreation Authority. You showed us some of the most unique scenery and one of the best trails we’ve ever experienced. It was an unforgettable ride and we can’t wait to explore Virginia and the Stone Mountain region with you again soon! Thanks again!